It's been a while since I've participated in a Grungy Monday challenge, and finally this week I was able to. Grungy Monday challenges are presented by Linda Ledbetter over at StudioL3 where we are challenged to use techniques by Tim Holtz then upload and share them over at Linda's blog. This week's challenge #35 is ATC's (Artisan Trading Cards) using at least one Tim Holtz product or technique, so be sure to hop over there and check out all the artistic creations. 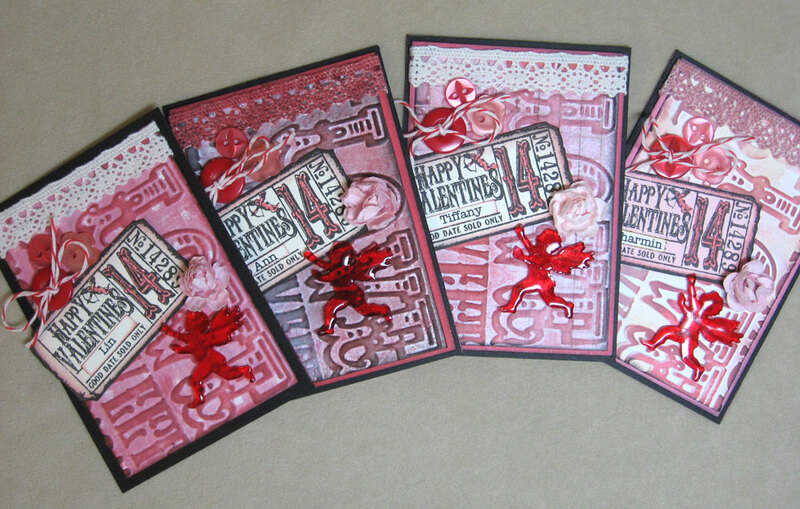 With Valentine's Day coming, I thought it would be fun to make Valentine ATC's for a few of my card-making buddies. Tim Holtz products used: Odds & Ends stamp set (ticket), Valentine Backgrounds & Borders Texture Fade, Victorian Velvet and Black Soot Distress inks, and Mini Love Struck Alterations die (shrink plastic cherub). I personalized each ATC with my friends' names which I typed on the computer and cut out. We're getting together today to make cards, so this will be a sneaky Valentine surprise. Thanks for stopping by today. Have a fabulous day! These are so sweet! I absolutely love the shrink plastic cupid!! Oh Annette, these are sooooo pretty! Well done! Muy bonita serie, el resultado precioso. el sello del ticket de San Valetín, me ha encantado. What a fun set of cards. I love shrink plastic & that cupid is FABULOUS! Te a quedadoo muy bonita, me a gsutado mucho el resultado de todos los ATC´s en conjunto. These are all precious!!! What a fun gift with such beautiful work! Wow, these Valentine's cards are great. 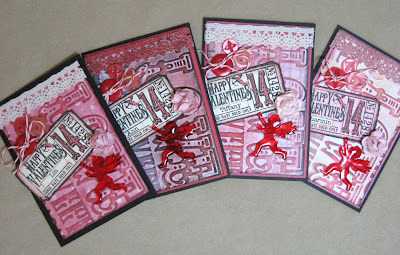 I just love the holiday-themed TH embossing folders, and that shrinky dink cupid is adorable !! These ATCs are sure gorgeous! 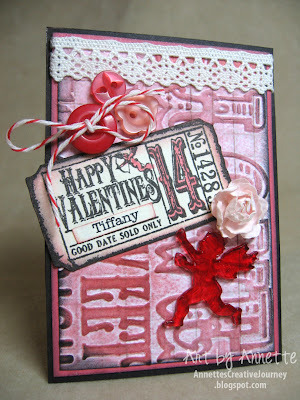 Aaah ,love these ATC's, so much creative goodness goin' on, love it love it !! Love these ATC's ... oh wait I said that already hugh?! 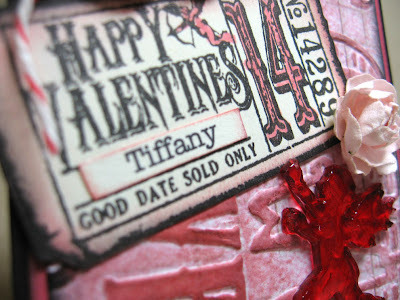 So happy that I'm hopping from Tim Holtz's blog to yours. Congrats on being one of the blogworthy links! I need to get started on my V-day project and your card just gave me a jump start! This is beautiful, love them. Nice use of the little Cupid too. These are beautiful cards!! Congratulations on making Tim Holtz's blog! I like the personalized ticket and the subtle difference on the ribbon. Very nice! Congrats on making Tim Holtz's blog! How beautiful! MIssed this the first time around and just spied it on Tim's blog. I love how you did the cherubs! Sooo pretty. I love your cupid!